Is there anything more opinionated than a coder and her tools? Perhaps debates about Star Trek versus Star Wars (Trek is better). With that in mind, let’s talk about tools for writing PowerShell code. I first cut my teeth on PowerGUI and then traded that in for PowerShell ISE once the ISESteroids module went mainstream. 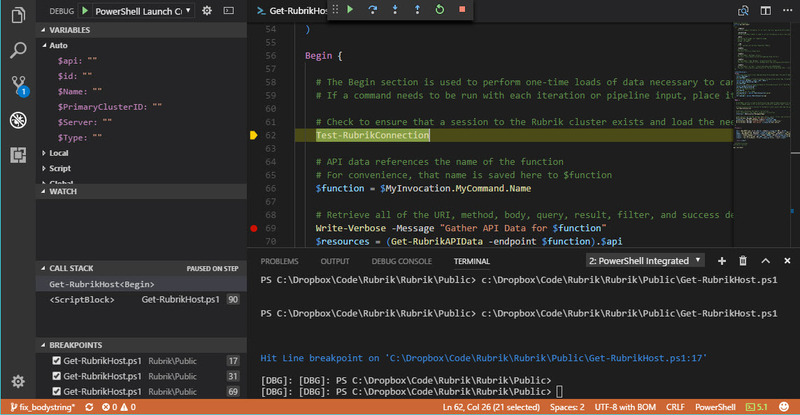 Ever since the PowerShell and DevOps Global Summit, however, I’ve been spending more and more of my time with Visual Studio Code (VSCode or @Code). And for good reasons, I think. Let me start this post by sharing how much I really enjoyed ISESteroids with PowerShell ISE. I supported the author with an enterprise license because the module is just that insanely awesome. However, the PowerShell folks have made it crystal clear that the PowerShell ISE is getting long in the tooth and not going to receive much love. They pointed me to VSCode. After gasping at the download size – I was expecting something along the lines of the previous Visual Studio editors – I realized that the initial release was far too lightweight for my needs and missed out on the features I enjoyed my previous setup. Now days, though, it’s pretty darn fantastic. Here’s a collection of three features you can find in VSCode that I think are pretty snazzy. One of my favorite features in the ISESteroids module was the ability to easily refactor code to adhere to space, tab, and formatting standards. This included the expansion of aliases, such as gmo turning into Get-Module; the addition of requires statements for needed version or module dependencies; and the normalization of line endings. Handy stuff. Visual Studio Code uses the Format Document command. Open the Command Palette (F1 key or Ctrl+Shift+P) and start typing format document to see the command or use the shortcut Shift+Alt+F. This will clean up the code in a similar fashion. What’s more awesome is that all of the format settings can be easily edited. Just cruise over to File > Preferences > Settings. From there, you can search for settings within the Default Settings JSON and even overwrite any of the settings to your own User or Workspace Settings configuration. For PowerShell specific formatting, enter powershell.codeFormatting into the search box to see the available configuration entries. This makes the creation, maintenance, and sharing of custom ISE configurations a snap. It’s also something you can version with Git! Intellisense is one of the most delightful features you can find in the PowerShell world. It helps autocomplete variables, cmdlets, and other bits of code. Taking that idea further, the “Problems” menu at the bottom of VSCode is a fairly verbose readout exclaiming anything you’ve done incorrectly within the code. I like the use of colors and a simple, human-readable error message. One click on the Problem will migrate the cursor to the issue painted in a squiggly red line. The last major feature that I rely on frequently is the debug console. Giving credit to PowerShell ISE for a moment, the use of ISESteroids made debug and variable exploration a snap. It’s a must-have for anyone writing a module or lengthy scripts, especially when functions are calling one another. The debug capabilities in VSCode are ridiculously good. Not only does the color coding help figure out where and what is being run, but the breakpoints menu (buttom left) also shows where all the active breakpoints exist in the stack. There’s also a snazzy variable explorer and integrated terminal so that you can view inside the code and even make changes in real time! I’m used to dealing with debuggers that mark all of the code read-only, making this the ultimate feature. Visual Studio Code is free and available for all major operating systems. It’s lightweight, easy to update, and has a wealth of open source plugins available. There’s native Git integration and a plethora of colorful themes to select from. Hats off to the development team on this slick and fun ISE! Seriously though, i concur, VSC is a great, free IDE for a PowerShell coder (f/m). There’s a ton of features, a wealth of extensions and a very active, community driven development cycle. Try it out, you won’t go back to your previous editor. I tried VSC already a couple of times but go always quickly back to ISESteroids and life is good. All the nice features of ISEsteroids makes me feel comfortable creating or editing scripts. I don’t have this with VSC, even with all the Powershell extensions enabled. Maybe I’m not yet ready to have this developer-centric editor. As a Sysadmin I would still prefer Microsoft would invest some more time in the ISE and at least give me a choice.. I love VS Code for editing my PoSH scripts, but I am amazed that MS has still not incorporated macro recording/playback. I still have to turn to Notepad++ frequently to adjust things. It’s really annoying. I have been using PowerShell ISE with ISE Steroids and I love it. I will have to give VSC a chance. It sounds awesome with the git integration. OMG! Is that some kinda troll… Trek is better?!? Is “Wrath of Khan” better than “Phantom Menace”? Sure, but so was “Galaxy Quest”. Is Kirk cooler than Luke Skywalker? Mostly, but face it, Han would have shoot Kirk dead from under the table long before Kirk could have… gotten out.. his first… sentence, while R2 shoved Spock into a garbage chute! Is Wesley Crusher half as cool as a 6-year old Anikin? Not even close! Is 7-of-Nine hotter than Princess Leia? Yes, 7 out of 9 times 7-of-Nine is hotter than Leia. Could a Ferengi beat a Jawa in a street fight? Trick question, Ferengi evolved from Jawa a long time ago.